Salt, sea, wind & air. Mix these with charming pastels, southern hospitality, warm hearts, and all kinds of embellished greenery. Yup, that’s Charleston for you. 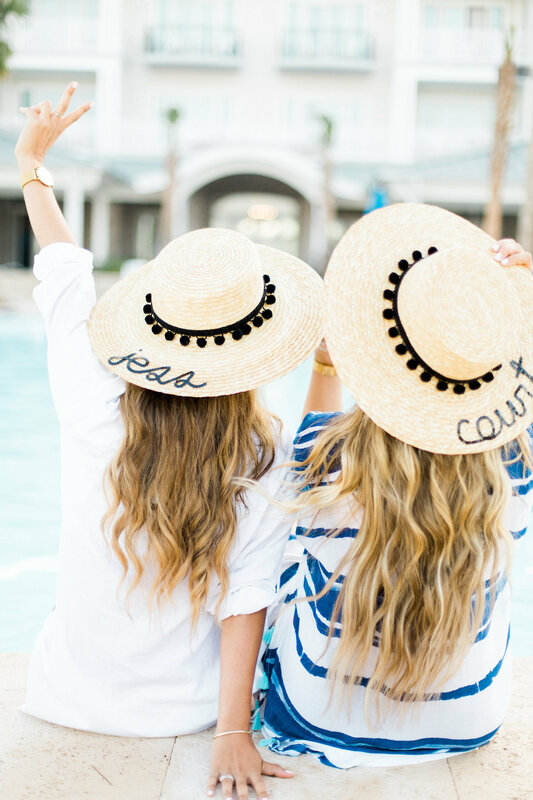 But even more specifically, that’s The Beach Club at Charleston Harbor Resort: the hotel that welcomed bestie Courtney and me with such warm hearts. Last week, we hopped on a plane to Charleston to enjoy the city’s notorious food, historic architecture, perfect weather, and good company. I’ve never felt so at-home in a quintessentially-southern hotel as I did at the Beach Club. The charming and (extremely) darling-esque ambiance at the hotel immediately won us over amidst the hotel’s interiors and lobby. But the swoon-worthy (no exaggeration here) pool overlooking Charleston’s Marina captured our hearts. Just look at these pics. Can’t you tell? 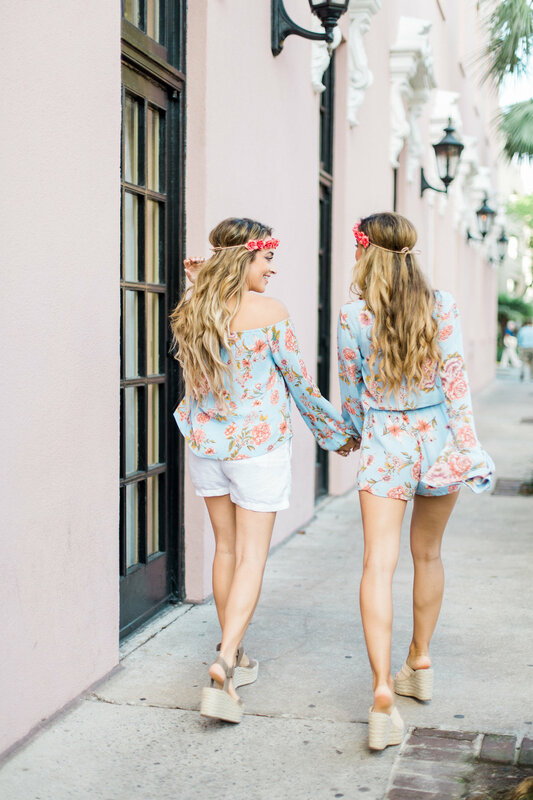 Rachel, one of Charleston’s acclaimed photographers, joined us on our adventure to capture our favorite moments and we immediately hit it off (if you’re heading to Charleston and need a photog – she’s your girl!). Courtney, the galpal who everyone thinks is my older sis (Guess what? We’re not actually related! ), is 19 weeks pregnant (big hint: that’s why I’m touching her belly in one these photos). So we took Charleston in the most relaxing way possible; tasting, shopping, sipping (a mocktail for her, of course!) our way through the city. 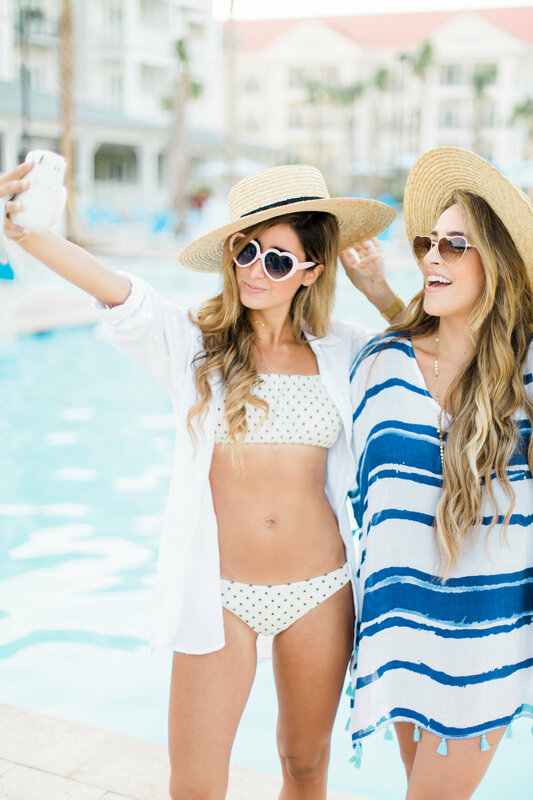 Laying out at the Beach Club‘s pool, which overlooks Charleston’s harbor in Mount Pleasant, felt like the ultimate cherry on the perfect girls’ getaway with a quiet and absolutely darling salt, sea, wind & air backdrop. Good company: Courtney‘s and my relationship is grounded in faith. 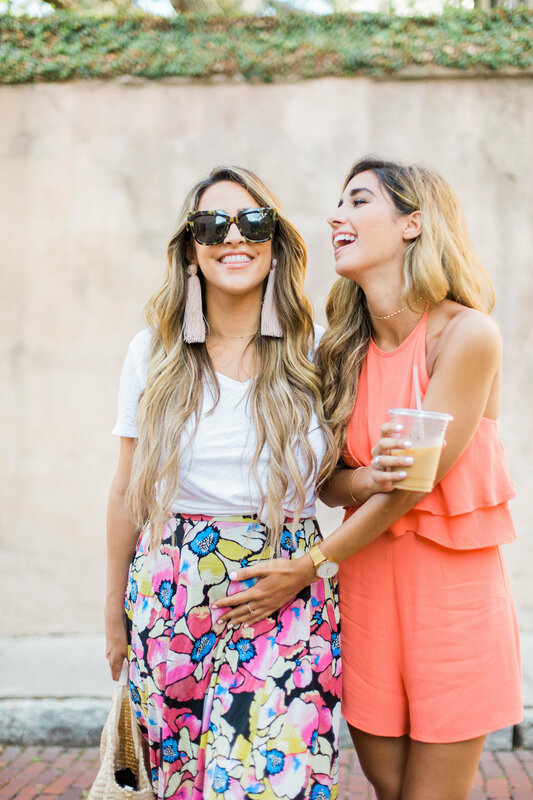 We believe this is the purest way to stay best friends forever — our trip was full of giggles and laughter, guidance, and deep talks. 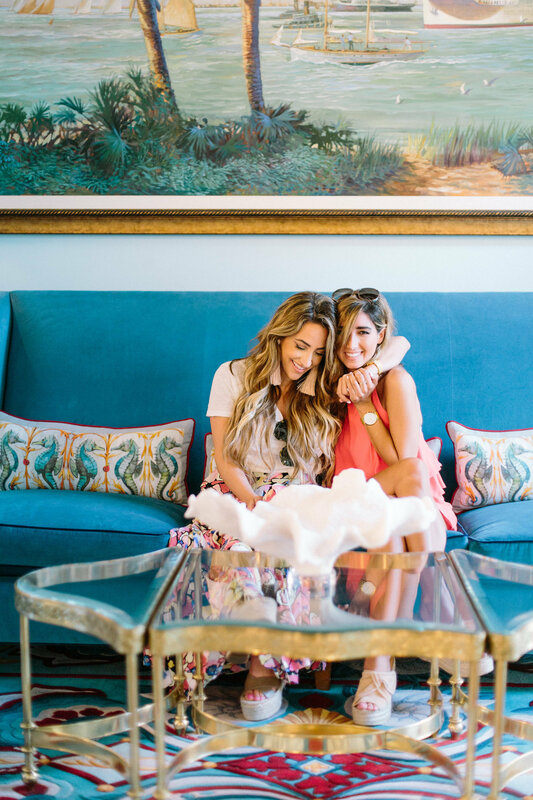 Ambiance is everything: Fluffy pillows, over-sized robes, periwinkle walls, marble counter-tops and an even an indoor-fireplace adorned our room at the Beach Club at Charleston Harbor Resort — allowing us the perfect environment to turn off the outside noise … and simply relax. Take care of your skin: I’ve suffered from skin issues for years now, and Courtney (being the beauty guru that she is) taught me to always bring a moisturizing sheet masque on a trip to use after your flight. Find my fave here. A good lotion is always helpful and I lather on after hitting the pool all day; find my favorite here. Make foodie reservations ahead of time: One week before our trip, Courtney and I scavenged the internet for Charleston’s best-kept dining secrets and notorious bites. Most restaurants in Charleston require reservations in advance, so booking our food stops before we left made the trip feel effortless and reduced the stress of planning in the moment. The Darling Oyster Bar was a perfect fit for my tastes (o-f c-o-u-r-s-e) and one of our favorite stops all trip. I found my favorite dairy-free latte at a local follower’s recommendation: Caviar and Bananas. Snacks are always a good idea: Both of us tend to get #hangry on the go, so bringing bars, nuts, snacks, and cookies along helped alleviate those too-hungry-can’t-think moments. Traveling involves so much walking around; it’s always good to be prepared. Plane attire should be fit for comfort: If you’ve been following my blog for awhile, you know I’m such an advocate of comfort. I wore these sweatpants and they’re the softest pair I’ve ever owned (under $50!). Get to know the staff: Our hotel staff was so amiable, and the more time we spent at the Beach Club, the more we fell in love with the hotel’s darling staff. Getting local recommendations from hotel staff members and making friendships will always bring good! Make the most of each day: One of my favorite things about Courtney and my relationship is we’re on the same page. Going to bed early made for early wake-ups, allowing us to get the most out of our trip and enjoy full days of sunshine. Play dress up: Courtney and I were so excited to work with one of my friends — Olivia Luko — who designed customized darling hats for us. You can customize your own hat here. 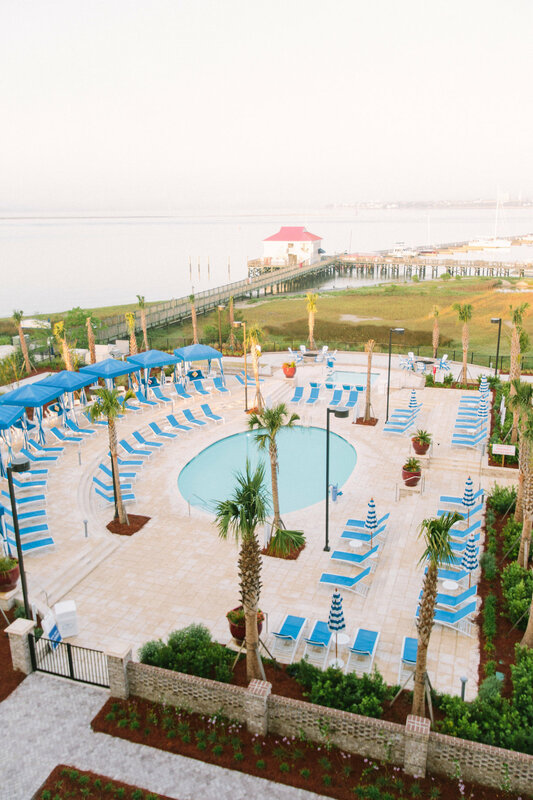 For more information about the Beach Club at Charleston Harbor Resort, click here. What a fun post, you guys are so adorable and looks like you had such a ball! Loving all your outfits, what a cute swimsuit and you look so beautiful and the color coral! This looks like a fabulous place to stay in Charleston! You two are the cutest! Thanks for sharing! So cute! I love the red romper look so much! You guys are the cutest! This sounds like exactly the kind of trip I would like to take! The hats are so cute!! Charleston is a beautiful city. And nothing is better than spending time with your friends. Looks like you had an amazing time! I would love to go to Charleston at some point! This looks like so much fun! You can just tell you all had a blast together! Nothing like girl time. How cute is the matching floral!!! 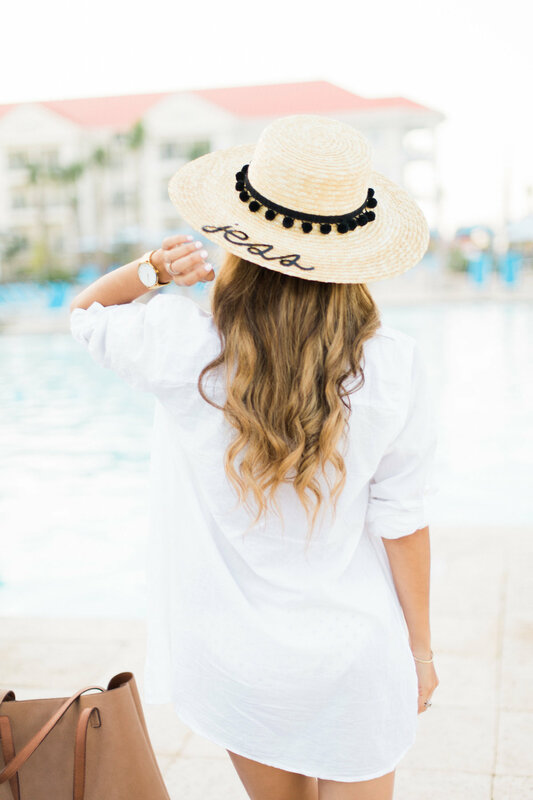 The Beach Club is the dreamiest! SUCH a great trip in the most charming city! Woow you look so gorgeous:-) This is such a pretty look of you. OH MY GOD! Looks amazing!!! Woww! Such a amazing pictures and outfits!! Great post!